It’s Spring. And Spring is the only sane time to be grilling (because Summer…so hot!). This year, I swore I would make sure our grill got cleaned and actually learn how to use a charcoal chimney so I could make you some delicious burgers and kebabs. But…I haven’t done it yet. 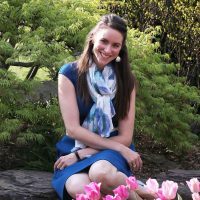 I’ve been a little too busy planting tomatoes and peonies and peppers and rhubarbs. So instead, I am making lentil burgers for Memorial Day, which you should definitely make, too, but on your stovetop (because…too soft for the grill grate). We can still have burgers! Grill be darned! I originally had a similar burger from an English pub chain called Wetherspoons. I combed the internet for years after, trying to find a copycat recipe…to no avail. Finally, last year, Sarah and I just decided to wing it and make these burgers for the fourth of July! It’s been so long I’m not sure how they really compare to their British inspiration, but these patties are delicious and perfect for all occasions. Sometimes it’s just better to be a vegetarian, amiright? Start with puy or green lentils. Rinse and then bring to a boil on the stove. Cook for 30 minutes, or until the lentils are soft and the water is absorbed. 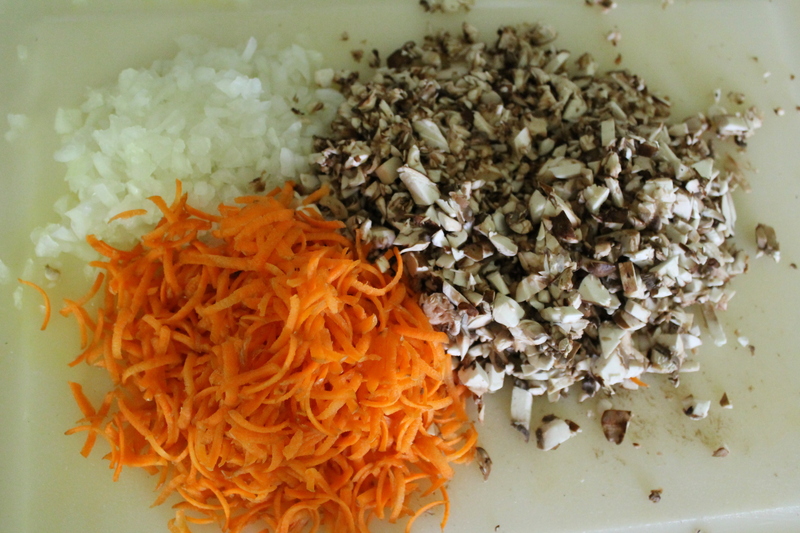 Meanwhile, chop up the rest of the veg: a large carrot (I recommend shredding or grating), an onion, and several cremini mushrooms. Sauté the chopped veggies all together in 1 tbsp. butter and 1 tbsp. olive oil. When they are nice and soft, about 4 minutes later, add a clove of minced garlic and sauté 1 minute more. 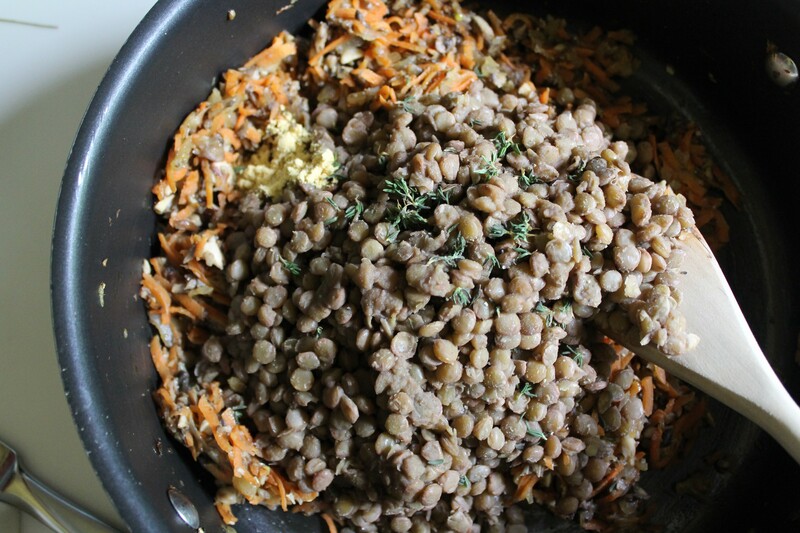 Combine the cooked lentils with the veggie mixture and stir in salt, pepper, dry mustard, and a heap of fresh thyme. Fresh thyme is the best, isn’t it? But it can be quite frustrating to get off the stem…sometimes I just end up ripping the more stubborn sections of stem, the ones that won’t let go of their leaves, into small bits and tossing them in with the rest. Now, in a separate bowl whisk and egg until it is evenly yellow. 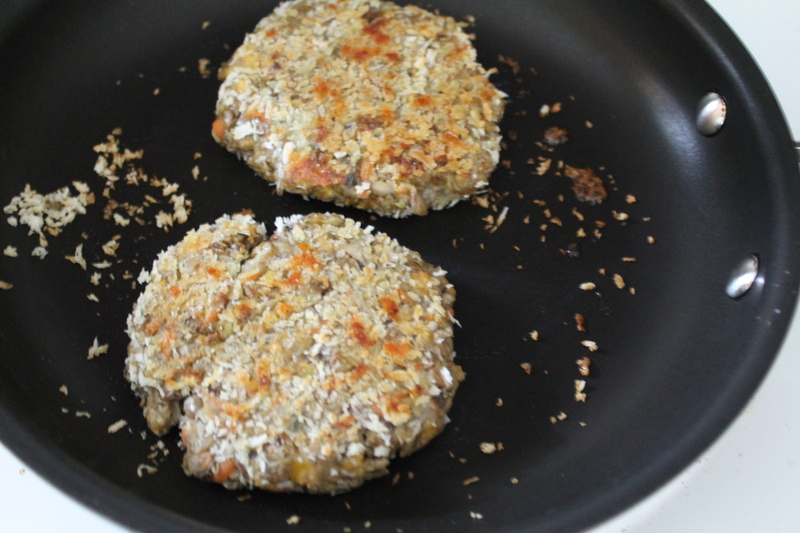 Add in shredded cheddar cheese and ground oats (or unseasoned bread crumbs; I used oats here because I read that it would help the texture of the patties to be a bit firmer, always a weakness of veggie burgers). 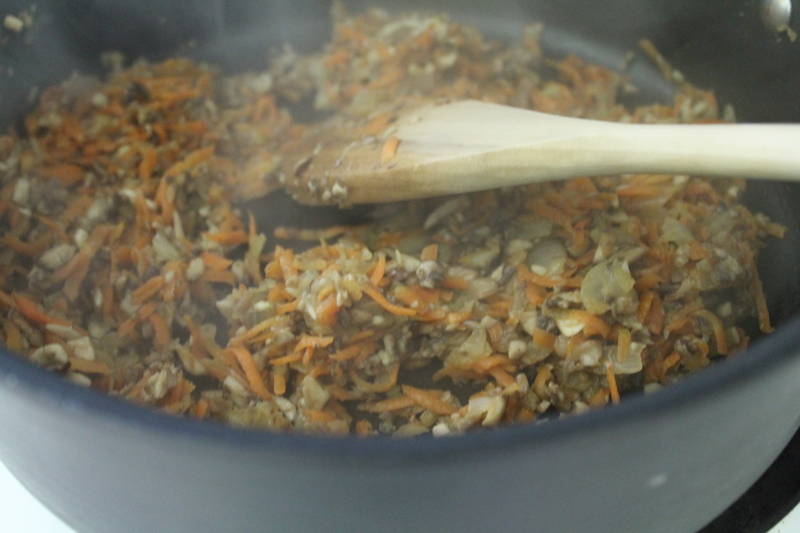 Stir in the lentil mixture. The whole shebang will be a bit sticky and pasty. Set the bowl in the fridge, covered, for about 30 minutes, or until completely cool and easy to handle. 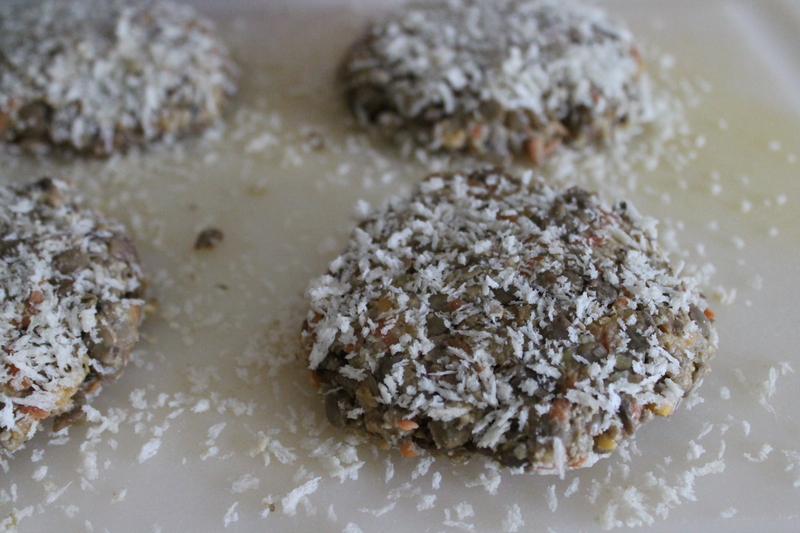 Shape the lentil mixture into 6 or 8 patties. Gently coat them in panko. I found this was easiest if I just pressed the patties into a layed of panko, then set them panko-side down and patted more panko onto the top of the patty. Sauté the panko-crusted burgers in batches for 3 minutes on each side, until the coating is browned and the burgers and cooked through. Make sure to keep the heat at medium or medium-low so the panko doesn’t burn! Transfer the patties to lightly toasted buns and garnish as desired. Sarah and I decided last year that fried eggs would be glorious! 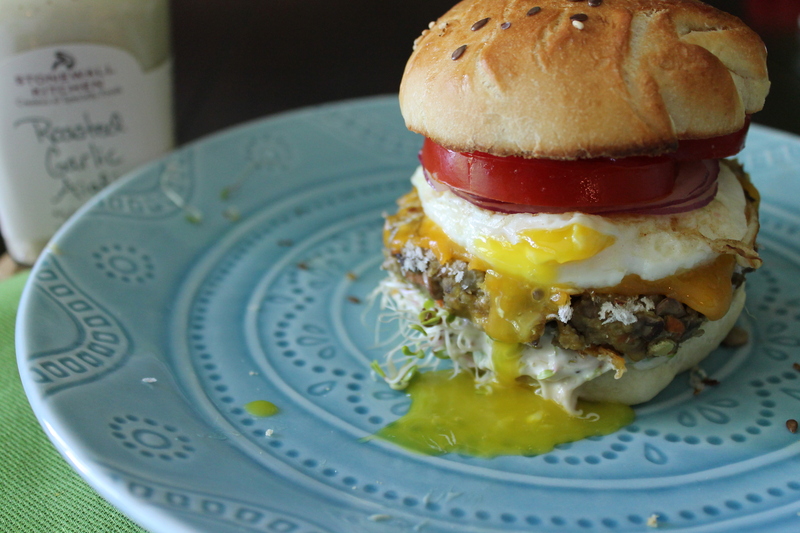 With perfectly runny yolks that act like an extra sauce and dribble down the sides of the burger…mmmm! What could be better than completely messy food? Frying eggs is very easy, but do make sure that you either have a fantastic non-stick cooking surface, or that you thoroughly coat the pan with butter or oil. I find that it’s easiest to cook only 2 eggs at a time, otherwise they all run into each other. Cook over medium heat, until the white is opaque, then flip and cook for another 10 seconds. Slide or scoop the eggs off the hot pan and set them gently atop the burgers. 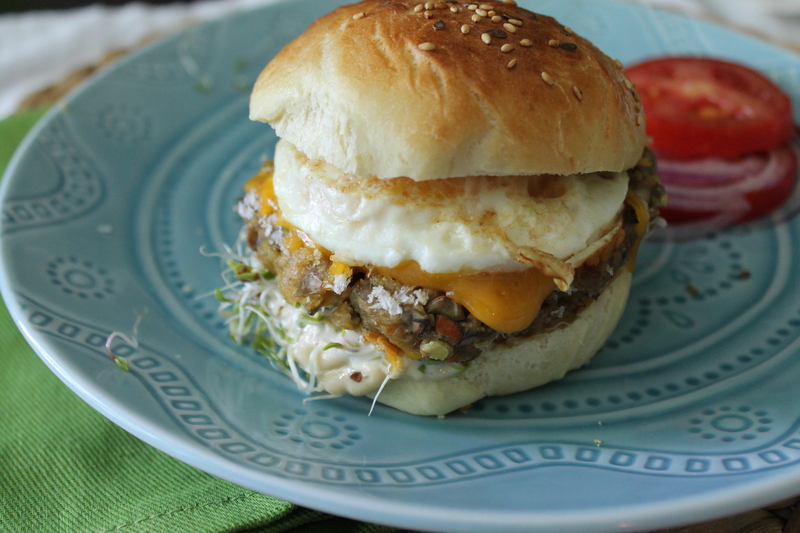 My favorite toppings for these lentil burgers are extra cheddar, fried eggs, roasted garlic aioli (mayonnaise would do just as well), a slice of ripe tomato, a slice of red onion, and a mound of alfalfa sprouts (lettuce would also work!). Yum. Rinse the lentils and bring to a boil with the water. 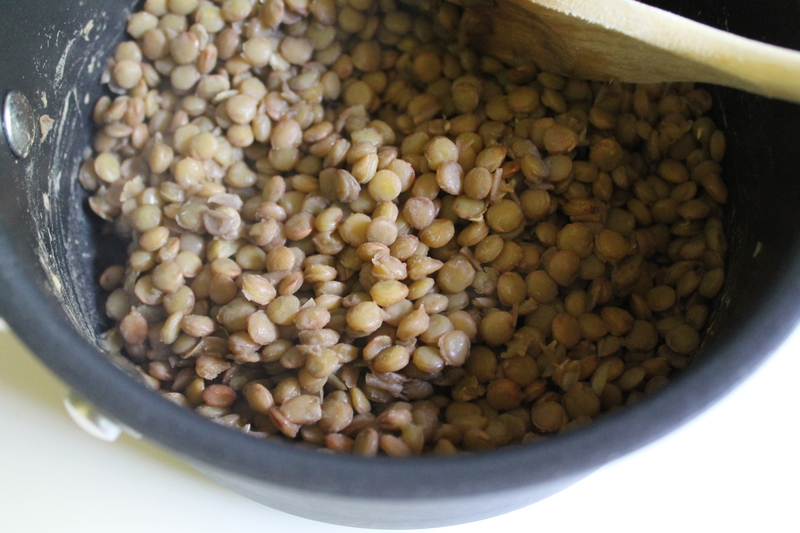 Reduce to a simmer and cook for 30 minutes, or until the lentils are soft and the water has been absorbed. Meanwhile, heat 2 tbsp. butter and/or olive oil in a skillet and cook the mushrooms, carrot, and onion together until soft, about 5 minutes. Add the garlic and cook 1 minute more, until fragrant. Combine the lentils and the veggie mixture and season with the salt and pepper, thyme, and mustard. Taste and adjust seasonings as needed. 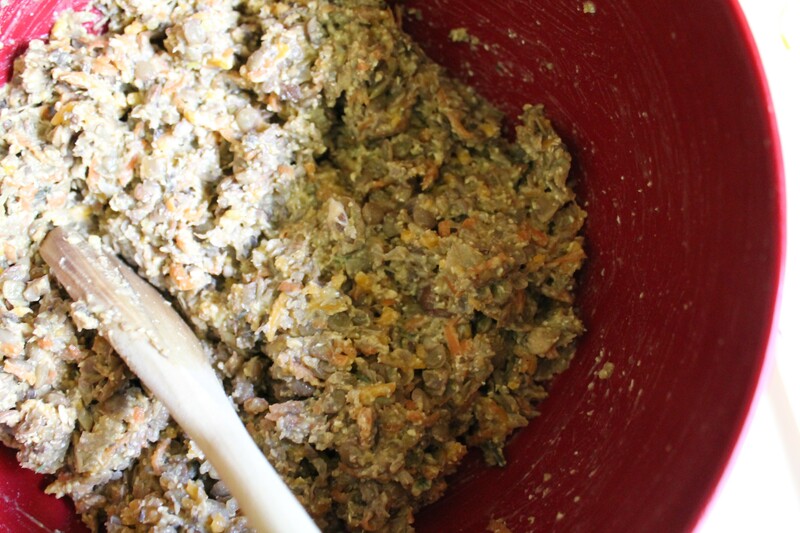 Mix with cheese, ground oats, and beaten egg. Cover the lentil mixture and chill in the fridge about 30 minutes. Form into patties and press each patty into the panko to coat. Heat the remaining 2 tbsp. olive oil in a skillet over medium and brown the patties, about 3 minutes per side. Just before removing from heat, top with extra cheddar. 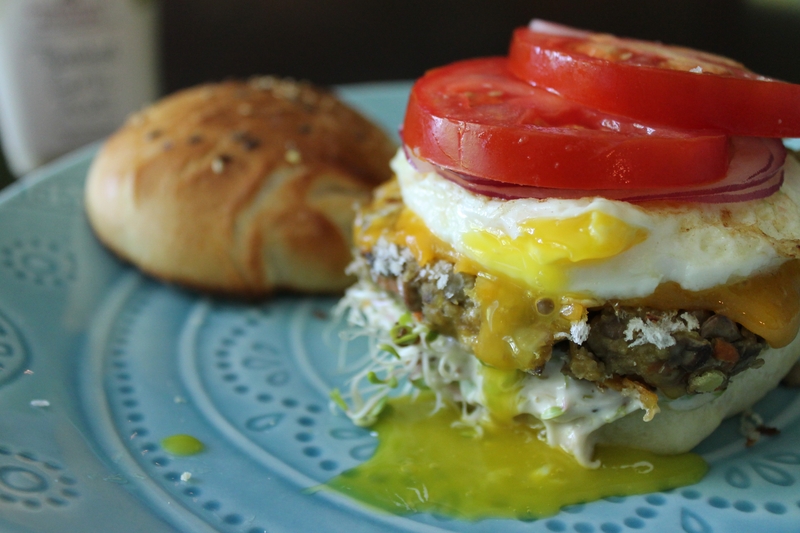 Set the patties atop burger buns and carefully lay a fried egg on top. Top with condiments and vegetables as desired.